Teddy’s Red, Hot & Blue is back! If you missed out last year, drop on in during the month of July and take a bite out of these delicious colors! We’re offering your choice of the original burger, crispy chicken or grilled chicken with Frank’s RedHot Cayenne Pepper Sauce, bacon and blue cheese. Red, Hot & Blue, get it?! Grab your burger on the go or dine in with your choice of fries, tots or onion rings. This is what you’ve been craving for! But wait! This meal wouldn’t be complete without a shake! This month’s featured shake: Haupia (coconut). 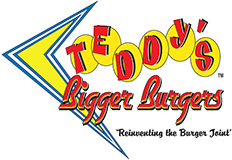 Make your tummy happy and come in to Teddy’s for the right meal and a delicious dessert. Stop by one of our locations and let us serve you a BIGGER meal!